WhatsApp is one of the most popular social applications that uses an internet connection to send message images, audio and video to other people. It allows users stay in touch with people around the world in such a very useful way and what's more, It is almost free. As we increasingly rely on WhatsApp for daily communication, almost everyone now has the WhatsApp application installed on their smartphones. If you want to transfer WhatsApp chats from iPhone X/8/8 Plus/7 to Samsung Galaxy S9/S9 Edge but feel it is hard to find an efficient way, then don't worry. In this article, we will teach you how to transfer WhatsApp chat history from iPhone to Samsung S9 in two different and simple ways. There is a lot of software on the market that can implement WhatsApp transmission. One of them is WazzapMigrator. This is a free and popular solution for transferring WhatsApp messages from iPhone to S9, including your chat history and all important media files (eg videos, photos, documents, etc.). However, the premise is that you need an iTunes backup extractor to extract WhatsApp backups from the entire iTunes backup. This process is a bit complicated. If you are patient enough, you can follow the steps below to learn how to extract the itunes backup message from the itunes backup and transfer it to the Galaxy S9. Step 1. Before you begin, make sure you have backed up WhatsApp chat history. To achieve that, you should connect your iPhone to your computer and launch iTunes. Step 2. Select your iPhone in the left column of iTunes, go to its "Summary" section, and select to take its backup on the local computer. Step 3. After completing the WhatsApp backup from iPhone, use the iTunes Backup Extractor to extract the WhatsApp backup file from it. Step 4. Connect your Samsung S9 device to your computer and transfer the extracted WhatsApp file to the device. Step 5. Congratulations, you are about to reach the end of victory. All you need to do is go to the Google Play Store to download the WazzapMigrator app. Step 6. Start the WazzapMigrator app and click the "Select iPhone Archive" option. Then, select your recently transferred iPhone backup file. After the above steps are completed, the transfer process will start automatically. The application will complete a list and start transmitting WhatsApp messages. 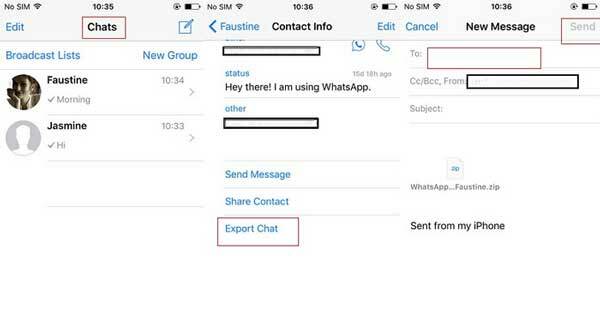 If you do not want to install additional software, you can also choose to manually export WhatsApp chat history from iPhone to S9. But if you do this, you need to check and select each WhatsApp conversation and then email them one by one. After the transfer process, you can view these WhatsApp conversations by visiting your email. This sounds a bit tricky, and this solution will not be able to sync the old WhatsApp message in your S9 application. 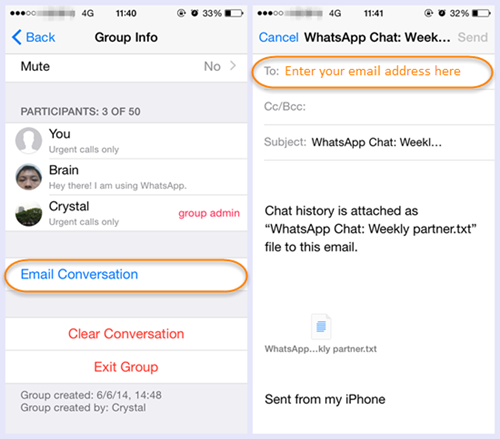 If you feel that you can tolerate these deficiencies, you can follow these steps to learn how to email WhatsApp chats from iPhone to S9/S9 Edge. Step 1. First of all, launch WhatsApp on your old iPhone and swipe left your conversations you want to save. Step 2. Navigate to the "More" option and click on "Export chat." Step 3. WhatsApp allows you to make choices to email the chat with or without media. Media content generally includes photos, videos, audio files, etc. If you choose to send with media, the amount of media depends on the maximum size of attachments that the email server supports. Step 4. Once you have selected a related option, a draft mail window will appear. And then you can enter the sender's email ID (preferably yours). Step 5. After the WhatsApp chat log is uploaded, you can click the "Send" button. After the transfer process is complete, if you want to see whatsapp chats on your S9, then you can simply open the email on your S9 and log in with the same email account. Then, you can view whatsapp messages in your email. As mentioned above, it does not synchronize email chats to WhatsApp. Additional Tips: How to Transfer Other Files from iPhone to Samsung S9? Apart from WhatsApp chats, you may have many other types of data you want to transfer from iPhone to Samsung Galaxy S9. Then, why not have a look at the Phone to Phone Transfer. 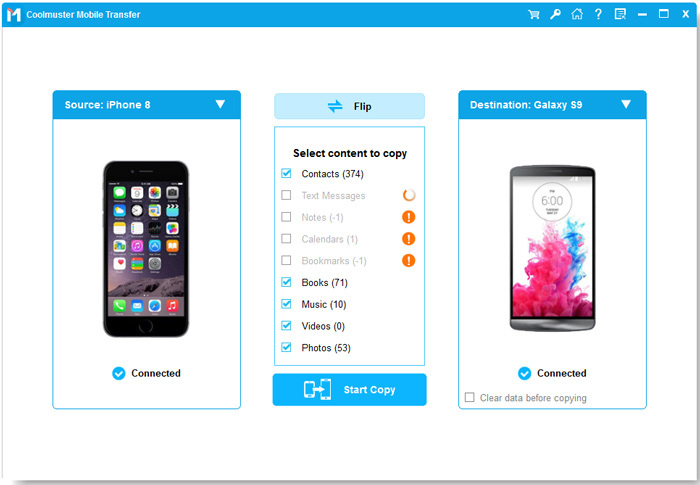 By using this program, you can realize the data transfer, including photos, videos, music, contacts, text messages and more from iPhone to Android, Android to iPhone, Android to Android, iPhone to iPhone. Windows phones are also supported by this program. It works on both Windows and Mac versions. How to Easily Backup WhatsApp Photos Videos on iPhone 7 Plus?